I was taught how to cast a fly when I was about 15 years old, so I have been fly fishing for some years now. 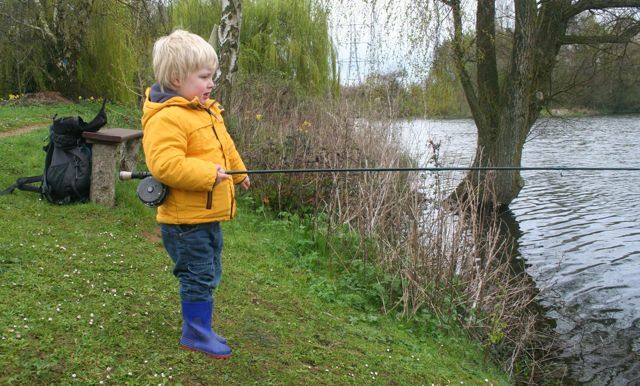 Although I have just dabbled with it really, so when my four year old son asked me to take him fishing, I thought, why not go for a trout? Saying yes to a four year old days ahead of the trip always ends up with an over excited child, but when I went to read his bedtime story and found his bed covered in fishing books, I did wonder what I might have started! The morning of the trip arrived, and we headed up to the lake nice and early to find that we had the lake to ourselves. Well, apart from a few geese, ducks and more importantly a few trout jumping. It was overcast but fairly warm, so things were set for a nice day. We kitted up and headed to the lake side where my son found a nice little place for us to fish. Now a four year old is a bit short for casting a line out so I started by casting the line out with a little white fly, which I have no idea what it was called, but my son liked the look of it! I past the rod to him and showed him how bring the line back in between his fingers, which to my surprise he picked up fairly quickly. I took over for a few casts and found myself really getting in to it. Casting a fly in to the depths and slowly retrieving it, hoping to tempt a hungry trout with little twitches, or fast retrieves is hypnotising. I kept getting little twitches and soon hooked a small Rudd. I would almost go as far to say it was a golden Rudd, beautiful looking fish, but as my son quickly added, a bit small! We moved swims to an open area, again chosen by my son, and as we arrived he spotted a big white and illuminous yellow fly in the tree. So, after much pleading, I got it down from the tree and tied it on for him. 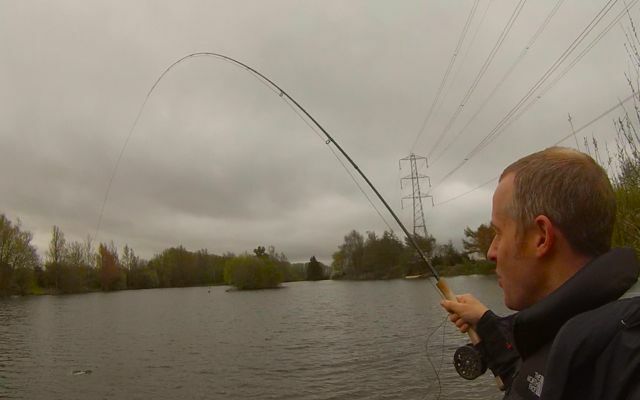 A few casts later and we had that sudden tightening of the line and and decent bend in the rod. This freaked my son out a little, so he opted to do the netting. It turned out to be a lovely Rainbow trout, and one for the table. More to the point as my son pointed out, it was on his fly! We moved to another little spot and after a few more casts, we hooked in to another Rainbow. This time I got my son to hold on to the rod to see how he coped. At first he was fine, but then the trout went on a huge run, and was soon taking more line off the reel, making that unforgettable whirring/clicking noise. This was too much for my son as I think he thought he may go in to the lake, so he grabbed the net and we finally landed a lovely trout in a joint effort. With two lovely rainbows for tea already, we moved to another little spot on the lake. After a quick picnic lunch, I decided to have a few more casts with this magic fly. I instantly lost a fish, so I quickly cast out again and maybe it was the same fish, hit the fly and put a decent bend in to the rod. Again it went tearing away and put up a really good fight all the way to the net. This time it was a nice Brown Trout, with the typical red spots and brown shine to it. 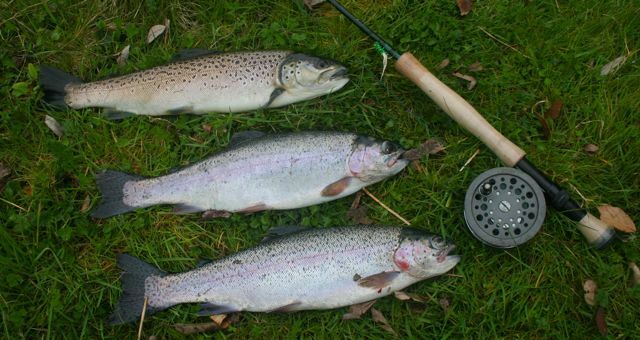 With fishing like this my son had been spoilt, three lovely trout for the table and in just a couple of hours. I had to explain to him that fishing wasn’t always like this! That night we cooked the trout and shared them around the table whilst telling our fishing stories. It really reminded me of my childhood and how one trip could inspire a child. Whenever I go fly fishing I always come away thinking I should do more of it, so now I have an excuse, a four year old who is inspired to not only catch more trout, but look for more flies in the trees!